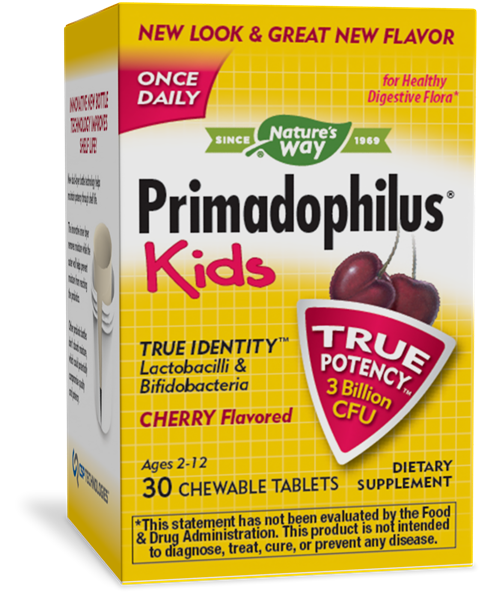 Primadophilus for Kids Cherry / 30 Chw - Nature's Way®. CAUTION: For children under the age of 2 years of age, consult a healthcare professional before use. Not for use in premature infants. Not for children under 2 years of age due to risk of choking. Keep refrigerated to maintain maximum potency. La-14® and Lp-115® are trademarks of DuPont, and are used under license. Innovative new bottle technology improves shelf life. Probiotic capsules for children 6+ with 3 billion CFUs & 5 strains of bacteria.